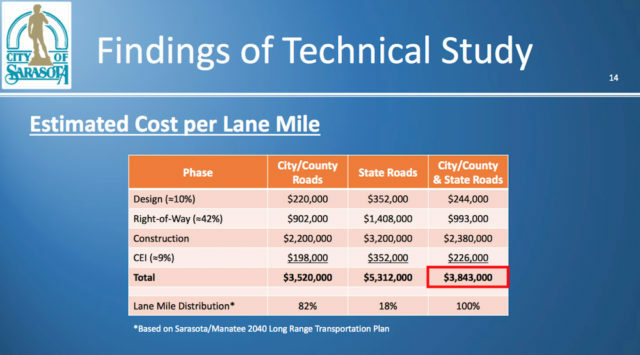 On a unanimous vote this week, the Sarasota City Commission approved the implementation of updated mobility impact fees at the maximum calculated rate. However, the Feb. 21 motion by Commissioner Susan Chapman excluded any credit for construction of “attainable” housing, as proposed. Instead, her motion directed staff to develop standards for determining how new construction in the Newtown Community Redevelopment Area (CRA) and North Trail geographical area of the city could qualify as very-low-income housing and low-income housing, with lower fees to be applied. What had been considered “attainable housing” in the draft of the new ordinance should be assessed the same mobility fee as if it were a regular dwelling unit, she clarified for her colleagues. A vote of approval upon a second reading of the amended ordinance will be required, and then a 90-day period must be observed before the new rates can be implemented, according to state law. Along with the Newtown CRA and North Trail geographical areas, the other two in the ordinance are City-Wide and Downtown. 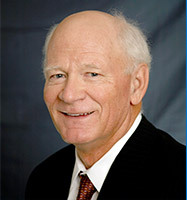 During the Feb. 21 public hearing, Steve Tindale, CEO of the Tindale Oliver consulting firm based in Tampa, affirmed that Chapman was correct in her interpretation of one segment of the report: The fees at their maximum calculated level will cover only 85% of the cost of new roads. “I’ve been doing this for 30 years. You will never collect from the development community the full impact of roads,” Tindale told the board. “It’s too expensive.” The full level realistically would be $15,000 or $20,000 a house, he added. Tindale Oliver undertook the necessary study last year as the basis for the new fees, City Engineer Alexandrea DavisShaw explained. The Florida Department of Transportation classifies levels of service according to drivers’ perception of congestion. Those roads with the best flow of traffic are ranked A. 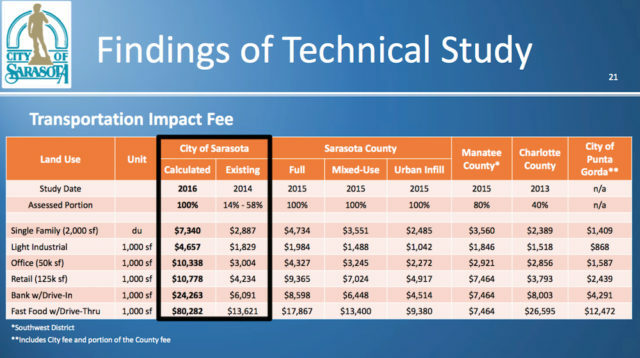 During his presentation, Tindale pointed out that the city participated in Sarasota County’s transportation impact fee program until 2014. When the City of Sarasota began its own program, he continued, city leaders kept the multi-modal approach the county had taken, and they established a fee schedule comparable to the county’s. He also explained the methodology behind the fees. 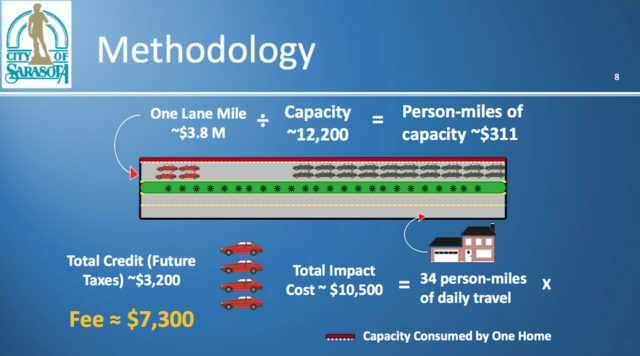 For example, Tindale said, one lane mile costs approximately $3.8 million; to move one person one mile costs about $311. “It’s very expensive,” he noted. new 2,000-square-foot home can be counted on to generate 34 person-miles of daily travel, he continued, so the total mobility impact fee would be $10,500. However, according to the methodology, credits must be deducted for future property tax payments. Therefore, the maximum calculated mobility fee for the 2,000-square-foot house would be $7,340. 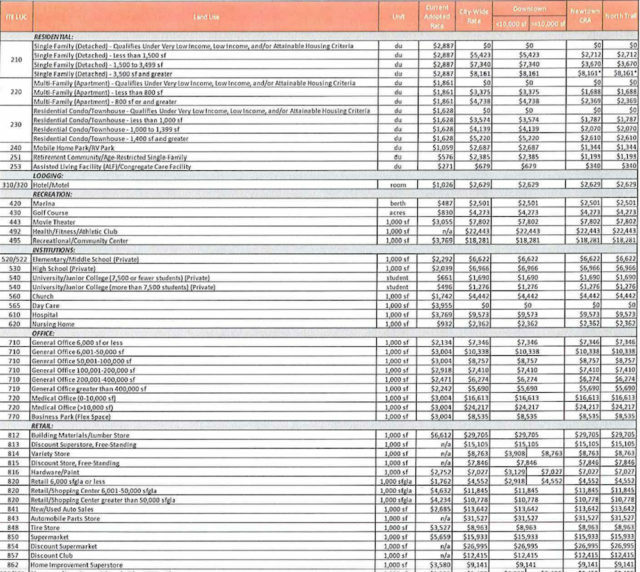 The city’s existing mobility fee for a dwelling that size is $2,887, he pointed out. In the 1980s, Tindale noted, the transportation impact fee for a 2,000-square-foot house was $1,500. Vice Mayor Shelli Freeland Eddie first raised the issue of affordable housing, noting that the study characterized attainable housing as dwelling units affordable to people earning between 60% and 120% of the average median income (AMI) in the Sarasota-Bradenton Metropolitan Statistical Area. The proposed maximum calculated fee chart called for no impact fee to be assessed of new attainable, low-income and very low-income multi-family housing units, single-family units or residential condominiums/townhouses in any area of the city. The fee for such a multi-family unit has been $1,861 since 2014; for a single-family home, $2,887; and for a condo or townhouse, $1,628. He also pointed out that staff had asked the firm to focus on affordable housing. As the fees are updated periodically, Tindale said, such incentives could be changed for particular areas of the city. They may need to be re-evaluated every three years, he noted. 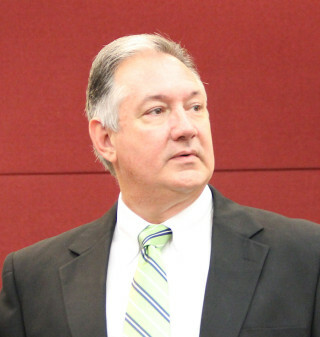 DavisShaw explained that, according to state law, the impact fees should be studied at intervals no greater than five years. Freeland Eddie also pointed to the “significant increases” in the fees for churches, as well as for single- and multi-family homes. The fee for a single-family home smaller than 1,500 square feet, for example, would rise from $2,887 to $5,423 in the City-Wide and Downtown areas. However, it would drop to $2,712 in the Newtown and North Trail areas. The fee for a multi-family apartment that is 800 square feet or larger would rise from $1,861 to $4,738 in the City-Wide and Downtown areas; it would be $2,369 in the Newtown CRA and North Trail areas. For a church, the fee would rise from $1,742 to $4,442 in all four geographic areas. Dan Lobeck of Control Growth Now told the board the city had lost “millions and millions of dollars since 2014” by keeping its mobility fees low. “That’s why the increases look big …” The developer of The Vue — located at the intersection of U.S. 41 and Gulfstream Avenue — would have paid $1 million in mobility impact fees at the full level the board was addressing that night, he added. Former City Commissioner Eileen Normile and Jennifer Ahearn-Koch, a City Commission candidate — both representing the STOP! organization —urged the board to implement the new fees.